India and Somalia on Tuesday signed a bilateral agreement for the transfer of sentenced persons, thus deepening humanitarian cooperation between the two countries. The agreement was signed between External Affairs Minister Sushma Swaraj and Foreign Minister of the Federal Republic of Somalia Yusuf Garaad Omar. "An important step in deepening humanitarian cooperation,India and Somalia sign bilateral agreement for transfer of sentenced persons," Ministry of External Affairs spokesperson Gopal Baglay tweeted. Earlier, External Affairs Minister Sushma Swaraj met Yusuf Garaad Omar, Minister of Foreign Affairs & Intl Coopn of Somalia. "Furthering coopn with an imp. African partner. EAM @SushmaSwaraj meets Mr. Yusuf Garaad Omar, Min. of Foreign Affairs & Intl Coopn of Somalia," Baglay tweeted. 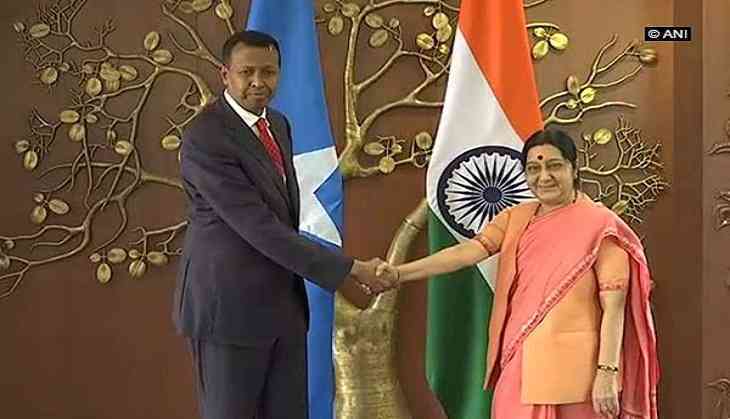 Foreign Minister of the Federal Republic of Somalia Yusuf-Garaad Omar arrived in New Delhi on Monday on a five-day visit at the invitation of Sushma Swaraj. This is his first visit to India since he assumed office earlier this year. Both the ministers discussed the entire gamut of bilateral relations as well as regional and international issues of mutual interest.